﻿How Do I Set My Email Preferences? Jam can send you email notifications for just about everything. This can be a great way to acclimate yourself when you first start using Jam, but once you're used to checking it, you may wish to eliminate some of that inbox clutter. You can easily change which email notifications you receive by going to Account > Email. 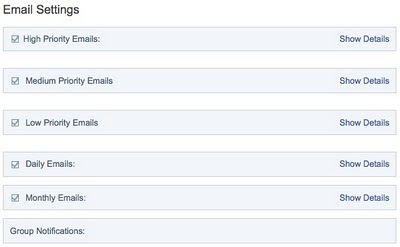 This page is organized into six sections that correspond to different categories of emails: High Priority, Medium Priority, Low Priority, Daily, Monthly and Group Email notifications. High Priority Emails are notifications associated with Jam events or activity that are the most important. This category of emails includes all of the Direct Messages that people send you plus all of those notifications that pertain specifically to you: When items are sent to your Jam inbox, when you're tagged in a photo, when one of your personal integrations needs attention, updates on your tasks, nudges that people send about status and items posted to your wall. Direct Messages to you (both @user and @@notify) will appear in your Home: @user page. Feed items related to being tagged in a Photo will appear in your Home: My Follows Feed. Integration Emails are a courtesy notification telling you that we've detected a problem with one of your integrations. If you turn these off, you won't get notified if we have detected an issue. Feed items related to Tasks will appear in your Home: My Follows Feed as well as in Home: My Tasks. Nudges for Status Updates will appear in your Home: My Follows Feed and Nudges for Task Updates will appear in the Task Feed for that Task. Medium Priority Emails include notifications on feed Comments and Likes, Invites that have been accepted, first clicks on your Links, Docs or Wiki pages, weekly new feature announcements and edits to Wiki pages. Feed Comments and Likes will be displayed the Feeds or Walls in which they were made. If you are following those items, then they will appear in your Home: My Follows Feed as well. Invites sent to you will appear in your Home: Inbox. First clicks on your Links, Docs or Wiki pages will not generate an email notification in Jam if you turn off the email notification. New feature announcements appear each week on the Jam product blog and in the Jam support forum. Low Priority Emails include Employee of the Month and Company Quiz notifications. If you turn off email notifications for these events, they will continue to appear in the Company: Company News Feed. The Daily Emails category let's you set your preferences for once a day email notifications. These include the daily Summary Email, Active Task Reminders and Daily Status Nudge. The Summary Email is a summary of daily activity. If you turn off all the Summary Email options you will not receive this email notification. This information is not provided anywhere else within the Jam user interface. Active Task Reminders are notifications that you can receive in email. The notification for an Active Task Reminder only appears in email. However you can always see the status of all your Tasks on the Home: My Tasks page. The Daily Status Nudge is a reminder, in email, to update your Status on Jam. This is only delivered via email notification. If you disable it, you will not receive an automated, daily reminder. You will still receive Status Update Nudges from other Jam users as applicable. The Group Notifications category shows the current status for each group you are following and allows you to manage your email subscription for each. You can choose to receive email notifications for each group immediately, daily, weekly or never. If you choose never, you will not receive email notifications for activity in that Group. However, you will still be able to go to that Group's Wall and view activity. You can use your email client to stay connected to your colleagues using CubeTree. You can post updates, comment, and keep up to date and aware of all the projects you're involved in using your standard corporate email client. Set your personal profile status by emailing an update to your Jam account. Every user on Jam has a specific email address to use to post a status update. You can find it by going to your "Account" page and looking for it at the top of the page. Jam uses the text from the Body of the email as the Status Update. This text will be visable to all members in your company. You can post a comment within Jam by responding to emails for applicable feed events (those that support the Comment action including Comments and Direct Messages you receive from the objects and people you are following). To do so, reply in email to any of these notifications and whatever you put in the Body of the email will show up in the feed as a comment you've added to the feed item. You can turn off an email notification by clicking on the "Unsubscribe" link provided at the bottom of any email you receive. When you click on "Unsubscribe" you will have the option of unsubscribing from the specific notification type ("Just this one") or to stop all email notifications sent by CubeTree ("Stop all emails). You can always return to your Account > Email Settings to re-enable email notifications.